One of the most popular MLB sets of the year, 2019 Bowman Chrome Baseball is a prospect collector's dream and it comes in a shiny chromium finish. 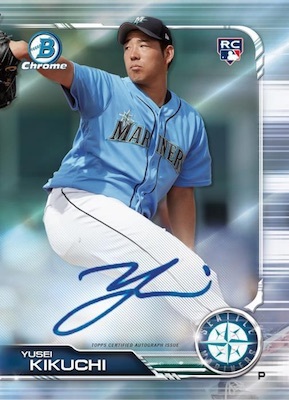 Filling in some of the key names that did not make it into 2019 Bowman Baseball, BC has two distinct Hobby formats. The main Hobby box is the standard option that offers two autographs per master box. There is also the HTA Choice format, which only has three cards in every box but all these cards are autographs. 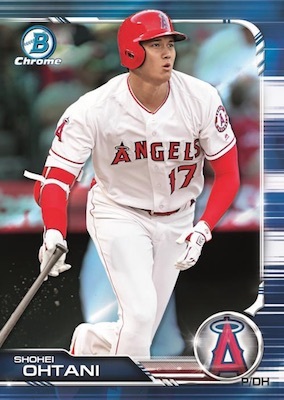 Because the HTA Choice boxes only have autographs, that means the base cards in 2019 Bowman Chrome Baseball are exclusive to the Hobby format. In general, each Hobby pack should have three base cards and two prospect cards. Parallels extend to both subsets and the prospect players get additional Shimmer Refractors, which average one per master box. 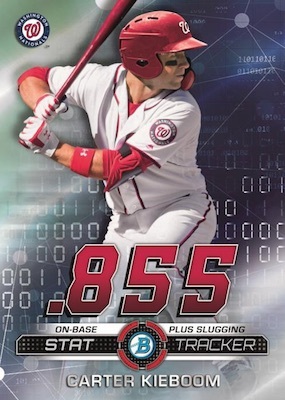 In addition, select rookie players have short-printed Base Image Variation cards. 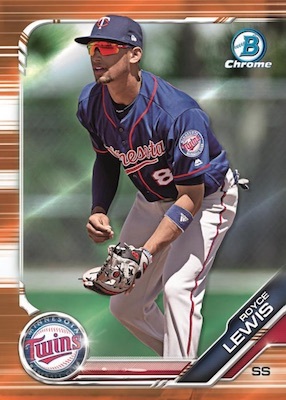 Inserts are exclusive to the primary Hobby format for 2019 Bowman Chrome Baseball, as well. Highlighting AFL standouts are the 2018 Arizona Fall League Fall Stars, 2018 Arizona Fall League MVP short print (#/25), and new Arizona Fall League Alumni cards, which are a case hit. Also new, Elite Farmhands covers notable prospects at one per master box, while Stat Tracker focuses on key statistics for top players. Parallels include Atomic Refractor (#/150), Orange Refractor (#/25) and SuperFractor (1/1) cards. 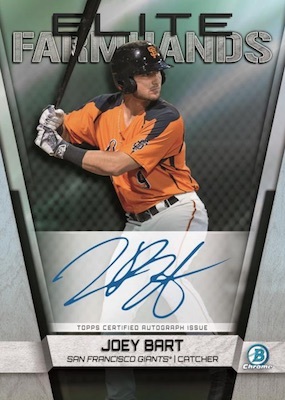 As usual, the 2019 Bowman Chrome Baseball checklist revolves around the hard-signed Chrome Prospects Autographs lineup. These subjects have several Refractor parallels that are exclusive to the HTA Choice boxes. 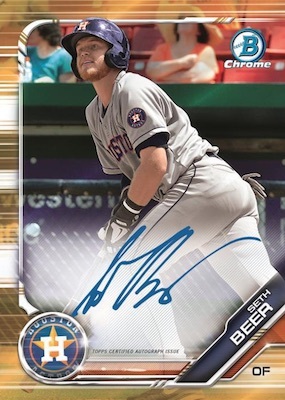 Recent MLB stars come into play with hard-signed Chrome Rookie Autographs. However, the Refractor rainbow is smaller than the prospect set. More on-card cards are found in the Chrome Autographed Relics set for prospects, rookies and veterans. These cards are serial numbered with Gold (#/50), Orange Refractor (#/25 - Hobby only) and SuperFractor (1/1) parallels. Prime Chrome Signatures cards (#/50) are only for the most hyped prospects and the HTA format has an exclusive Orange Refractor (#/25). Adding a signature to the insert sets, the numbered Elite Farmhands Autographs and Stat Tracker Autographs cards also have Orange Refractor (#/25) and SuperFractor (1/1) editions. Hobby-only insert signatures include sequentially numbered 2018 Arizona Fall League Fall Stars Autograph, 2018 Arizona Fall League MVP Autograph (#/100) and Arizona Fall League Alumni Autograph cards. Also exclusive to Hobby, a few rookie players have an SP Image Variation Autograph version limited to 25 copies. And, of course, there are the normal All-America Game Autographs (#/199). 2018 Bowman Chrome Enyel De Los Santos Orange Refractor Auto Rookie 23 25 HOT!!! 2018 Bowman Chrome 1st auto refractor Carlos Rincon Mint. Combine Shipping. 2018 Bowman Chrome Baseball Factory Sealed Hobby 2 Autos Per Box OHTANI? 2018 Bowman Chrome Hobby MINI Box 1 Auto (Shohei Ohtani Acuna Torres Rookie)?